Buy A Twin Cities Duplex for A Bigger Home | Your best resource for buying, selling, owning and investing in duplexes and duplex homes. Over the last year, I’ve started to see different kinds of buyer walking through the duplexes I hold open on Sundays. I like to think of them as genius’. Completely independent of one another, several have had an idea I’d never considered: reconverting a duplex into a single family home. 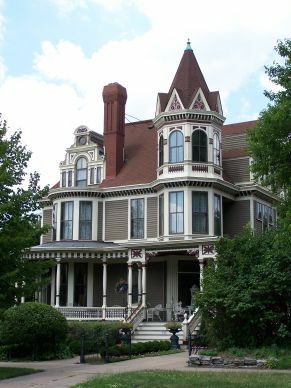 Primarily in the Victorian era, many Twin Cities homes were built which, even by today’s standards, are mansions. In the century or more since their construction, countless property owners who couldn’t fill the homes with their own families divided the home into more than one unit. These conversions are usually quite obvious. The upstairs unit typically has a compartmentalized feel. The living room is down the hall and the size of a bedroom and the kitchen shoved into a back corner somewhere, more often than not lining up with the home’s plumbing stack. More often than not, these duplexes, triplexes and fourplexes are located in one of the popular waterhoods: walking distance from a lake, river or creek and its accompanying amenities. These neighborhoods are popular and have a high demand for properties. As a result, single family homes have become cost-prohibitive for many growing families. Why not convert some of those awkward duplexes back into their original use? There are presently several foreclosure and short sale duplexes on the market that, were they still single family homes, at or near their present prices, would have sold already even in a down market. In a restored condition, the long term up side would be tremendous. Granted, they’re going to take money to repair and reconvert. But remember, one of the best things about buying a multi-family property is 75 percent of the rental income may be used to help a buyer qualify for a loan on the property. The property does not need to be occupied; an appraiser can simply make an estimate of the market rent. A buyer can choose to convert the property immediately, or, rent one of the units while living in and working on the other. The rental income would help offset the expenses of the restoration. Let me know if you’d like to see one.